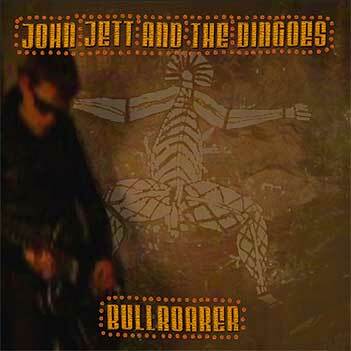 ‘Bullroarer’ is the recording debut for Australian guitar player John Jett. This chunky instrumental is named after a native Aboriginal musical instrument, which carries its sound for several miles. The bullroarer is used to warn people: there’s a men-only meeting coming up, not suitable for women and children. Watch out, girls. John Jett was already an accomplished surf guitar player when for the first time in his life he saw waves. John was born and raised in the Alice Springs area in central Australia, where the creeks are hot and rain falls once every couple of years. He learned the tricks of the trade by listening to his Uncle Swagger’s enormous collection of Californian surf trash records. Jett travelled north to the Darwin area and played night after night with his trio Ayers Rock, often to confused audiences who expected his namesake Joan (‘Where is the chick singer?’) on stage. Like most folks from down under he saved money for years and undertook a trip to Europe. In the city of Groningen he met his girl Marieke and decided to stay on. Platex Records fell like a brick for John Jett’s growling string strumming style. ‘Bullroarer’ was recorded with local musicians Sieto Kiewiet and Dim Junius. “Good guys”, John says, “if I strike it big I will surely take ’em home to Australia to play the barns and beaches.